Captain Mike Fleece was happy to step and help us on our first trip. 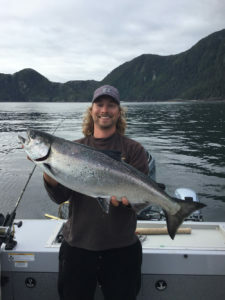 He is one of SE Alaska's best charter fisherman and we look forward to filling our freezer with him each Summer. For anyone looking for a great guide we highly recommend THE ALASKA CATCH. Alaska Canopy Adventures offers one of the best opportunities to experience the best of Alaska. The zipline tour takes you through the tree tops of SE's famous Tongass national forest. There is no better view of Alaska's raw natural beauty then that from Alaska Canopy Adventures. They were generous enough to offer our group a complimentary trip and we recommend everyone try out this wonderful adventure. Russell Cockrum is a legendary Southeast Alaskan salmon fisherman, as well as a Veteran. He was generous enough to host our group on his Commercial boat the "Viking Maid" to experience first hand salmon fishing. He is also a great cook as he invited our 2016 class out to his home for a world class fresh Alaskan seafood banquet. Thank you Captain Russell Cockrum for your ongoing support. Alaska Travelers Rentals is Ketchikan's Premiere accommodation service. Mrs. Mary Bolshakoff helped coordinate excellent beach front lodging for our 2016 trip and we will always look to this company to help support our annual efforts. Thank you Alaska Travelers Rentals. Southeast Aviation has been an incredible supporter since our first year. The company is a cornerstone of life in SE Alaska. They generously took our vets out to the incredible Misty Fjords National Park. Thank you Jim and Southeast Aviation.